There were no other people in the café who could understand Tibetan, but I still dared not hastily ask DZ about what happened in Lhasa. 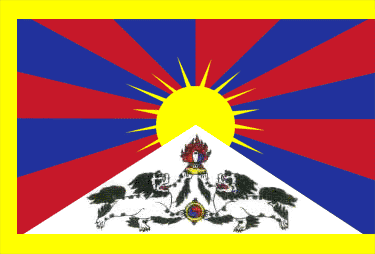 DZ had the disposition of an aristocrat in old days, therefore, I teased him saying, “you look more Tibetan than us. If you wore Tibetan clothes, you would look like a Tibetan in Chi-itsog Nying-pa (spyi tshog rning pa, old society)”. But, while laughing, JM said that he himself who was light in colour and thin, definitely could fake his way into the crowd. Thus, DZ suddenly said, “Now I often dream that there are soldiers holding their guns all over Lhasa; while walking on the streets in Beijing, when I see armed police and policemen, I am, for no reason, angry and afraid too”. When DZ looked out of the window and said these words in a moderate tone, I knew that he was willing to tell us some things. “Did you see firing at the crowd? ” I asked. “I quickly ran back to my place. I was tired and frightened, so I fell asleep as soon as I lied down. But the next day I had to go to take care of those foreign tourists. As soon as I stepped out of my house, I became stunned. In front of me there were soldiers everywhere, some holding sticks and clubs and others holding guns in their hands. I wanted to go back, but the soldiers called out loud to me ‘Come over!’ I had to force myself to go over there. Two soldiers told me to hold up my two hands just like when one surrendered himself, then they searched my body. I was terribly frightened. I had my amulets in the pocket of my jacket,” DZ took out his amulets and showed us very quickly. I noticed that in addition to Sung-dud (srung mdud, a sacred cord) he also had Ten sung (rten srung, amulate). The latter is a sacred object especially blessed by the Dalai Lama and it symbolizes removing ill-fortune and avoiding calamities. It is very precious for Tibetans. I also had a badge of Kundun (one of the honourific titles for the Dalai Lama). If the badge had been found by the soldiers, then I would definitely have died. I was quietly praying to Kundun. Indeed Kundun was protecting me. Thought that soldier held my pocket between his fingers several times, he did not find it, then he howled at me, “Beat it!” I denoted a sense of gratitude in DZ’s expression of rejoicing at his good fortune. Of course, this was his gratitude toward the Dalai Lama. He prayed, then his prayers were answered. “I heard that those soldiers also checked Tibetan’s necks, if they found a badge of Kundun hanging on the ‘Sung dud’, they would pull it off and threw on the ground. Is that so?” I asked. DZ looked into my eyes, and said slowly, “no, not just men. As long as you are Tibetan, no matter whether you are a man or a woman, old or young, just like me, you would be searched by raising your hands like you were surrendering. Do you know that I had never experienced such an insult before? I saw we Tibetans raising our hands as if we were surrendering and being searched by soldiers with guns in their hands. Even the old people were not spared, neither were girls. I remembered the movies I had watched. Those movies about Japanese ‘devils’ invading China or about the nationalists fighting against the communists were just like what were happening in front of my eyes. I also looked into DZ’s eyes, and saw that his eyes were full of humiliation”. I remembered it was late at night when we left the café. The lights were brighter and the Chinese were still rushing about like tidal water. Suddenly DZ, who looks more Tibetan than any of us, opened up his fist and said in a very low voice, “I worry that they would recognize me as a Tibetan, so I dare not wear it any more”. And in the palm of his hand was a small turquoise earring. So does WD. When he said goodbye to me, he just said “zab zab je”, then he disappeared into the crowd of people. He is a Tibetan man who would be recognized as Tibetan even if he did not wear Tibetan clothes. I only recently got to know him, and I have met him three times. But I can not describe it in too much detail, as he repeatedly told me, “Do not write who I am. I still want to go back to Lhasa. My I.D. card was recorded by them and they also took my picture. Do not write who I am, otherwise they will find me”. He is a young and handsome Amdo Tibetan, but his two eyebrows were knotted showing that many worries were weighing on his mind, and frequently he would suddenly look around as if he were frightened. In spite of the situation, he readily agreed to my request to interview him. At that time we accidentally met each other, and it was so accidental that it appears to have been destined. Meeting each other at that place and at that moment unexpectedly seems as if he just wanted to tell me about his experience. However, it did not go smoothly when we tried to meet again. Soon we parted with each other and each went our own way because there were people following us. Only when we met the third time very cautiously, perhaps because no one paid any attention to us, I was able to have a complete record. On the second day, the policemen in plain clothes increased greatly right away in the Barkhor Street. There were also thirty or forty women with very short hair, and all of them were Han Chinese. When they saw there were people chatting with each other, they would walk over to listen to the conversations. I do not know whether they could understand but they scared people. They had their lunch and dinner on the square, they ate food in boxes delivered to them. There were cars that sent boxed lunches and dinners. The crowd did not disperse until it was about to be dusk. 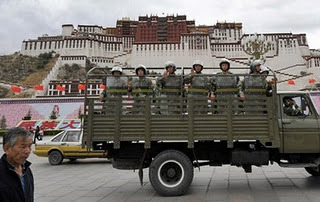 All Tibetans knew that they were policemen in plain clothes, and we were reminding each other quietly. There were also more policemen, who looked very serious, and were walking back and forth in the square. Oh, that’s right, I heard that monks from Drepung and Sera Monasteries had staged a demonstration but they were beaten back by many armed police. The Jokhang and Ramoche Temples were also closed [to the public]. I interrupted him and said, I heard about this on TV. Only Tibetans, and only Tibetans from the countryside and grassland could make that kind of sound. Tibetans in the cities could not make any such sound as their throats have already degenerated.” Furthermore, I also wanted to say it is a pure Tibetan-style whistle, but it was portrayed as “howling of wolves”. I had been following the people all the time. There were more and more people pouring from Tromsikhang into the Barkhor area. There were about 100 people. There were people from Amdo, Kham and Lhasa. There were also a few monks. People walked around the Barkhor twice. While walking, they were shouting Gyawa Rinpoche kutse trilo tenpa sho (Long live the Dalai Lama), “Bo Rangzen” (Tibetan Independence). While they were walking around, they destroyed the shops owed by the Chinese and Chinese Muslims. Silk and satin in one shop were thrown out, which was colourful and they were scattered all over the ground. Some people also set fire to Barkhor police station diagonally across from Jokhang Temple but it did not burn fiercely. I called JM in Beijing and he was very excited when he heard the news. It was because in March 1988, similar things happened. At that time JM was a teenager, he burned the gate of a shop and he was imprisoned for four years. Probably when it was nearly 3:00pm or it just after 3:00pm, people in black clothes came, their faces covered and only showing two eyes. They were holding guns and they fired at people. “Who knows? Right, I saw a few policemen taking pictures. Ah, there were also policemen videotaping.” WD was recalling. Now I remember that it is indeed very strange. There was only one street between these two sides, but they were like two worlds.